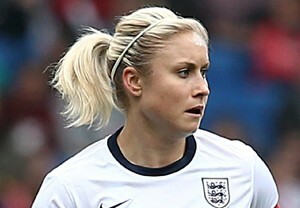 Since her debut in 2007, Houghton has played over 50 times for the England national team. She was unfortunate to suffer serious injuries immediately before the 2007 World Cup and Euro 2009, but recovered to play in the 2011 World Cup and Euro 2013. She was made England captain in January 2014. Houghton came to prominence at the 2012 London Olympics, scoring three goals in Great Britain’s four games, including winners against New Zealand and Brazil. At club level Houghton started at Sunderland in her native North East England before moving on to Leeds United in 2007 then Arsenal Ladies in 2010. An extremely versatile player, she broke into the Sunderland team as a striker before moving back into midfield and later into defence.